She called for a probe of the budget utilization at the clinic. I would like to be realistic to say a few words concerning health delivery system in Nigeria. It is very poor, sorry to say that. I am happy that the MD of Aso Clinic is here. Dr Manir, I am happy that you are here. As you are aware for the past six months Nigeria was not stable because of my husband’s ill health. We thank God that he has fully recovered now. If somebody like Mr President can spend several months outside Nigeria, you wonder what will happen to a common man on the street in Nigeria. Few weeks ago I was sick as well; they advised me to take a first flight to London; I refused to go. I said I must be treated in Nigeria because there is a budget for an assigned clinic to take care of us. If the budget was N100 million, we need to know the way the budget is spent. And along the line I insisted; they called Aso clinic to find out if their X-ray machine was working, they said it was not working; they didn’t know that I was the person that was to be at that hospital at that very time. I had to go to a hospital that was established by foreigners in and out 100 per cent. I think it is high time for us to do the right thing. 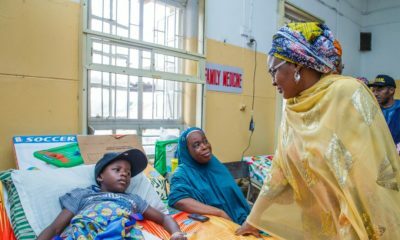 Aisha Buhari acknowledged that Nigeria had very good health policies, the best in Africa. Yes of course we have (policies) but implementation is always the problem. So we need to change our mindset and do the right thing. There are lots of constructions going on in that hospital but there is no single syringe there; what does that mean? Who will use the building? So we have to be good in reasoning; you are building and there is no equipment, no consumables in that hospital and the constructions are still going on. 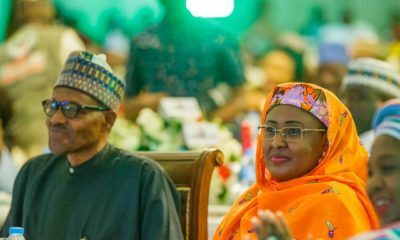 Aisha Buhari urged the governors wives to champion the cause of advocacy to support the RMNCAH and N programmes in their various states. 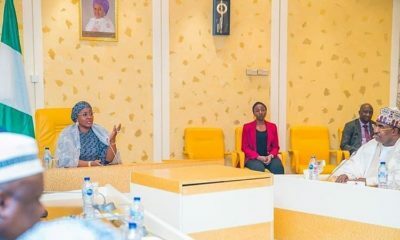 Accordingly, Aisha Buhari donated a floor of the three-storey building of the Future Assured Centre in Wuse Abuja to the Women for the purpose of the advocacy. She pledged to commit all platforms available to her as wife of the President and as champion of RMNCHA and N to continue to provide maximum support to the importance cause and urged the governors’ wives to do same. There is a foul rot in the leadership of this country, the old man is no longer in charge. He has given power to Funta and his fuckman mallam daura and his son, people we did not elect. When a leader lets people beneath him call his wife names over the phone call, insult her and he does not immediately fire them, please tell me, is that what is called a man? When a president misses the opportunity to use his wife to touch lives, even at limited capacity; is that a man that is aware? Please this administration is soooo over. Even most of his ministers have been quiet and mellow. We don’t have a direction anymore. Nigerians are tired and fed up. Please who can save us from this mess called Buhari? Massive corruption under the mr intergrity continues to unfold. Yes, we do not trust Mr. Corruption anymore. If stealing and mismanagement is under his own roof, then all his efforts has been nothing more than a sham. Who is fooling who? His daura people have finished him. I pray and hope the Sw and se and ss pull out of his campaign. Let us see if he can win an election with the northern vote alone. I am looking for a new person to support. I am sooo over this old senile man. Looking at the video, I forgot to mention that this woman is really beautiful. She must have been really sick and they didn’t inform us. I just hope she is careful sha…daura and his group are more interested in power and money. I wonder after all the ruse who much billions he has siphoned out togethe with kyari to foreign accounts using funta and his front man. Anyway, who do Nigerians think will make an effective president so we can fire this one….we need a younger president or at least someone that is intune with his people. What has a “a 40-year-old man who is still living in his father’s house created a state out of a state and that is a major setback to the country” got to do with Aso Rock Clinic? My own is why is it not?Governors Wives Advocacy Group Of Nigeria (GWAGON)?? This people lack creativity abeg.